We offer state-of-the-art portable vocal booths and sound isolation enclosures for the education sector and professional studios. Modular by design, the booths operate as an external standalone sound isolation solution or as an additional booth for an existing studio. 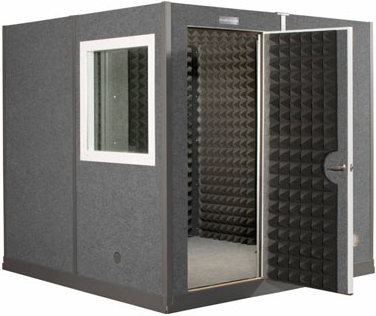 The most common applications for an isolation booth include recording, voice over, broadcast, studio control, audio post production, drum isolation, rehearsal and meeting rooms. Each isolation booth features a completely enclosed system including cable ports, active ventilation, optional windows and unlimited customisations. Available in a single or double-wall design, sizes range from 4′ x 4′ to 16′ x 16′. Our isolation booths are offered as a standard cuboid shape or a pentagonal design to maximise corner space and eliminate parallel wall problems. Our dedicated audio team offer specialist advice, products and support for acoustic treatment and soundproofing. Whether you need internal treatment for music studios, post production, rehearsal spaces, broadcast or meeting rooms; we can evaluate what acoustics will be required to control the sound within any room and application. Services include; onsite pre-analysis, CAD diagrams showing correct placement for suggested treatment, installation and sound design plans to integrate with existing systems. Also, if you are having problems with a noisy neighbour or need to reduce the amount of external sound within a room; we can help with construction plans for studio rebuilds and design.